Ireland manager Colin Bell says his side are still striving to bridge the gap between them and the top nations after last night’s loss. 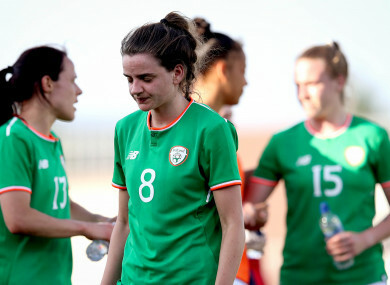 Leanne Kiernan looking dejected after the final whistle. YOU COULDN’T SAY the Ireland players lacked commitment in yesterday’s 2-0 World Cup qualifying loss to Norway, but it was the manner in which they conceded that frustrated manager Colin Bell most. The visitors — top seeds in Group 3 — were technically superior to the Girls in Green and, on another day, could have left Tallaght Stadium with five or six goals in the bag. It was always going to require a backs-against-the-wall performance, but while Ireland have looked far more solid as a unit since Bell took charge last year, they gave away two preventable goals from set-pieces on the night. “I thought the energy levels were good,” Bell said afterwards. “The girls gave everything, but we’re using too much energy. If I say we’re wasting energy it sounds quite harsh, but when we have possession we give it away too easy at times and that costs even more energy. “That leaves you open because you’re attacking, then it’s difficult against strong teams like the Norwegians, who move the ball very well and who are technically very good players. We know that they are better than we are, but you can still give them a much tighter game and when you look at it we conceded from a corner and a free-kick. “Yes, Norway were the better side but you cannot concede those types of goals and expect to stay in the game. You cannot make those mistakes against quality teams. Again, it’s a learning curve and sometimes you have to have a smack in the face or a couple to really learn. With the scoreline still at 1-0 early in the second half, Ireland striker Leanne Kiernan created a goalscoring opportunity for herself, but the shot wasn’t hit with any venom and Norway goalkeeper Ingrid Hjelmseth got down to save. “We had a little phase in the second half and we should have scored. Leanne with a great run, but she’s got to finish it,” Bell added. “They are the moments as well… instead of a low shot, just whack it into the net like she did against Slovakia. She was great in the one against two situation but you’ve got to finish those. Ireland now sit in third, trailing Norway by two points with a game extra played. The reserve fixture takes place in Stavanager on Tuesday and Bell’s team finish up qualifying at home to Northern Ireland in August. Two wins are required to keep their slim chances of making a World Cup play-off alive and the Ireland boss wants to at least avoid another defeat. “If we lose again then it’s done,” he said. “Okay, a draw would definitely be a success. We’re playing against top teams, there’s no doubt about that, and I think you can see the difference. They’re individually stronger and better, but they are the things we’re aiming for. Influential defender Louis Quinn was forced off with a suspected broken nose late in the first half, and she must be a major doubt for Tuesday, although Bell was non-committal. Email “'Norway were the better side but you cannot concede those types of goals and expect to stay in the game'”. Feedback on “'Norway were the better side but you cannot concede those types of goals and expect to stay in the game'”.